This page is about the capital of Utah. For other uses, see Salt Lake City (disambiguation). Salt Lake City, often shortened to Salt Lake or SLC, is the capital and the most populous municipality of the U.S. state of Utah. With an estimated population of 190,884 in 2014, the city lies at the core of the Salt Lake City metropolitan area, which has a total population of 1,153,340 (2014 estimate). Salt Lake City is further situated within a larger metropolis known as the Salt Lake City-Ogden-Provo Combined Statistical Area. This region is a corridor of contiguous urban and suburban development stretched along an approximately 120-mile (190 km) segment of the Wasatch Front, comprising a total population of 2,423,912 as of 2014[update]. It is one of only two major urban areas in the Great Basin (the other is Reno, Nevada). Disputes with the federal government ensued over the Mormon practice of polygamy. A climax occurred in 1857 when President James Buchanan declared the area in rebellion after Brigham Young refused to step down as governor, beginning the Utah War. A division of the United States Army, commanded by Albert Sidney Johnston, later a general in the army of the Confederate States of America, marched through the city and found it had been evacuated. This division set up Camp Floyd approximately 40 mi (64 km) southwest of the city. Another military installation, Fort Douglas, was established in 1862 to maintain Union allegiance during the American Civil War. Many area leaders were incarcerated at the territorial prison in Sugar House in the 1880s for violation of anti-polygamy laws. The LDS Church began their eventual abandonment of polygamy in 1890, releasing "The Manifesto", which officially suggested members obey the law of the land (which was equivalent to forbidding new polygamous marriages inside the U.S. and its territories, but not in Mormon settlements in Canada and Mexico). This paved the way for statehood in 1896, when Salt Lake City became the state capital. The First Transcontinental Railroad was completed in 1869 at Promontory Summit on the north side of the Great Salt Lake. A railroad was connected to the city from the Transcontinental Railroad in 1870, making travel less burdensome. Mass migration of different groups followed. Ethnic Chinese (who laid most of the Central Pacific railway) established a flourishing Chinatown in Salt Lake City nicknamed "Plum Alley", which housed around 1,800 Chinese during the early 20th century. The Chinese businesses and residences were demolished in 1952 although a historical marker has been erected near the parking ramp which has replaced Plum Alley. Immigrants also found economic opportunities in the booming mining industries. Remnants of a once-thriving Japantown – namely a Buddhist temple and Japanese Christian chapel – still remain in downtown Salt Lake City. European ethnic groups and East Coast missionary groups constructed St. Mark's Episcopal Cathedral in 1874, the Roman Catholic Cathedral of the Madeleine in 1909 and the Greek Orthodox Holy Trinity Cathedral in 1923. The city has experienced significant demographic shifts in recent years. Hispanics now account for approximately 22% of residents and the city has a significant gay community. There is also a large Pacific Islander population, mainly made up of Samoans and Tongans; they compose roughly 2% of the population of the Salt Lake Valley area. Astronaut photography of Salt Lake City west of downtown, taken from the International Space Station (ISS). North is at bottom. The city is located in the northeast corner of the Salt Lake Valley surrounded by the Great Salt Lake to the northwest and the steep Wasatch and Oquirrh mountain ranges on the eastern and southwestern borders, respectively. Its encircling mountains contain several narrow glacial and stream carved canyons. Among these canyons, City Creek, Emigration, Millcreek, and Parley's border the eastern city limits. The second-highest mountain range is the Oquirrhs, reaching a maximum height of 10,620 feet (3,237 m) at Flat Top. The Traverse Mountains to the south extend to 6,000 feet (1,830 m), nearly connecting the Wasatch and Oquirrh Mountains. The mountains near Salt Lake City are easily visible from the city and have sharp vertical relief caused by ancient earthquakes, with a maximum difference of 7,099 feet (2164 m) being achieved with the rise of Twin Peaks from the Salt Lake Valley floor. The city, as well as the county, is laid out on a grid plan. Most major streets run very nearly north-south and east-west. The grid's origin is the southeast corner of Temple Square, the block containing the Salt Lake Temple; the north-south axis is Main Street; and the east-west axis is South Temple Street. Addresses are coordinates within the system (similarly to latitude and longitude). Odd and even address numbering depends on the quadrant of the grid in which an address is located. The rule is: When traveling away from the grid center (Temple Square) or its axes (Main Street, South Temple Street), odd numbers will be on the left side of the street. 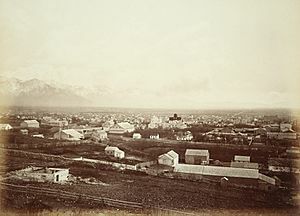 The streets are relatively wide, at the direction of Brigham Young, who wanted them wide enough a wagon team could turn around without "resorting to profanity". These wide streets and grid pattern are typical of other Mormon towns of the pioneer era throughout the West. 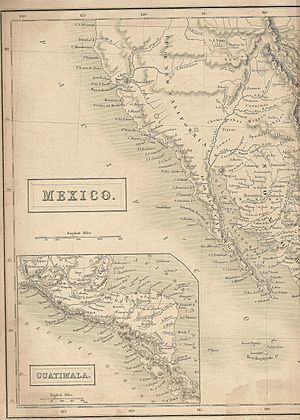 Though the nomenclature may initially confuse new arrivals and visitors, most consider the grid system an aid to navigation. Some streets have names, such as State Street, which would otherwise be known as 100 East. Other streets have honorary names, such as the western portion of 300 South, named "Adam Galvez Street" (in honor of a local Marine corporal killed in action) or others honoring Rosa Parks, Martin Luther King, Jr., César Chávez, and John Stockton. These honorary names appear only on street signs and cannot be used in postal addresses. In the Avenues neighborhood, north-south streets are given letters of the alphabet, and east-west streets are numbered in 2.5-acre (1.0 ha) blocks, smaller than those in the rest of the city. 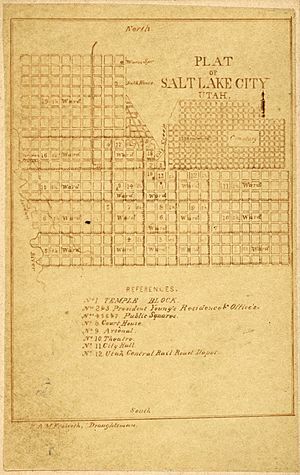 Joseph Smith, founder of the Latter-day Saint movement, planned the layout in the "Plat of the City of Zion" (intended as a template for Mormon towns wherever they might be built). In his plan the city was to be developed into 135 10-acre (4.0 ha) lots. 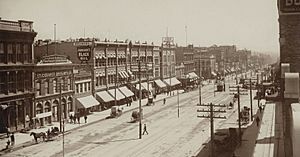 However, the blocks in Salt Lake City became irregular during the late 19th century when the LDS Church lost authority over growth and before the adoption of zoning ordinances in the 1920s. The original 10-acre (4.0 ha) blocks allowed for large garden plots, and many were supplied with irrigation water from ditches that ran approximately where modern curbs and gutters would be laid. The original water supply was from City Creek. Subsequent development of water resources was from successively more southern streams flowing from the mountains to the east of the city. Some of the old irrigation ditches are still visible in the eastern suburbs, or are still marked on maps, years after they were gone. There are still some canals that deliver water as required by water rights. There are many lots, in Salt Lake City and surrounding areas, that have irrigation water rights attached to them. Local water systems, in particular Salt Lake City Public Utilities, have a tendency to acquire or trade for these water rights. These can then be traded for culinary water rights to water imported into the valley. At its peak, irrigation in the valley comprised over one hundred distinct canal systems, many originating at the Jordan Narrows at the south end of the valley. Water and water rights were very important in the 19th and early 20th centuries. As heavy agricultural usage changed into a more urban and suburban pattern, canal water companies were gradually replaced by culinary water systems. The west side of the city has historically been more culturally diverse. People of many faiths, races, and backgrounds live in the neighborhoods of Rose Park, Westpointe, Poplar Grove, and Glendale. It has always been considered a classic and diverse area, although recently its affordability has attracted many professionals and the more youthful generation. For example, the small, increasingly trendy Marmalade District on the west side of Capitol Hill was heavily gentrified and is now an eclectic and desirable location. Just northeast of Downtown is The Avenues, a neighborhood outside of the regular grid system on much smaller blocks. The area from South Temple North to 6th Avenue is a Historical District that is nearly entirely residential, and contains many historical Victorian era homes. Recently the Avenues is becoming known for intimate restaurants and shops opening in old retail space mixed within the community like Hatch Family Chocolates, Avenues Bistro on Third. The Avenues are situated on the upward-sloping bench in the foothills of the Wasatch Range, with the earlier built homes in the lower elevation. The Avenues, along with Federal Heights, just to the east and north of the University of Utah, and the Foothill area, south of the university, contain gated communities, large, multimillion-dollar houses, and fantastic views of the valley. Many consider this some of the most desirable real estate in the valley. The climate of Salt Lake City is commonly claimed to be semi-arid, but under the Köppen climate classification, Salt Lake City has a hot-summer humid continental climate (Dfa) with hot summers and cold, snowy winters. The primary source of precipitation in Salt Lake City is massive storms that move in from the Pacific Ocean along the jet stream from October to May. In mid-to-late summer, when the jet stream retreats far to the north, precipitation mainly comes from afternoon thunderstorms caused by monsoon moisture moving up from the Gulf of California. Although rainfall can be heavy, these storms are usually scattered in coverage and rarely severe. However, downtown was hit by an F2 tornado on 11 August 1999, killing 1 person, injuring 60, and causing $170 million in damage. The remnants of tropical cyclones from the East Pacific can rarely reach the city during Fall. The remnants of Hurricane Olivia helped bring the record monthly precipitation of 7.04 inches (179 mm) in September 1982. 1983 was the wettest year on record, with 24.26 inches (616 mm), while 1979 was the driest, when 8.70 inches (221 mm) were recorded. Spring snowmelt from the surrounding mountains can cause localized stream flooding during late spring and early summer, the worst examples being in 1952 and especially 1983, when City Creek burst its banks, forcing city engineers to convert several downtown streets into waterways. Snow falls on average from 6 November to 18 April, producing a total average of 60 inches (152 cm), although measurable snow has fallen as early as 17 September and as late as 28 May. The snowiest season was 1951–52, with 117.3 inches (298 cm), while the least snowy season was 16.6 inches (42 cm) in 1933–34. The snowiest month on record was January 1993, in which 50.3 inches (128 cm) were recorded. The nearby Great Salt Lake is a significant contributor to precipitation in the city. The lake effect can help enhance rain from summer thunderstorms and produces lake-effect snow approximately 6 to 8 times per year, some of which can drop excessive snowfalls. It is estimated about 10% of the annual precipitation in the city can be attributed to the lake effect. Salt Lake City features large variations in temperatures between seasons. During summer, there are an average of 56 days per year with temperatures of at least 90 °F (32.2 °C), 23 days of at least 95 °F (35 °C), and 5 days of 100 °F (37.8 °C). However, average daytime July humidity is only 22%. Winters are quite cold but rarely frigid. While an average of 127 days drop to or below freezing, and 26 days with high temperatures that fail to rise above freezing, the city only averages 2.3 days at or below 0 °F (−17.8 °C). The record high temperature is 107 °F (42 °C), which occurred first on 26 July 1960 and again on 13 July 2002, while the record low is −30 °F (−34 °C), which occurred on 9 February 1933. During mid-winter, strong areas of high pressure often situate themselves over the Great Basin, leading to strong temperature inversions. This causes air stagnation and thick smog in the valley from several days to weeks at a time and can result in the worst air-pollution levels in the U.S., reducing air quality to unhealthy levels. This same effect will also occasionally play a role in the summer months, causing tropospheric ozone to peak in July & August, but in 2015 it started at the beginning of June. In 2016 Salt Lake's air quality was ranked 6th worst in the nation by the American Lung Association. It received an F grade for both ozone and particulate matter. Particulate pollution is considered especially dangerous, as the tiny pollutants can lodge deep in lung tissue. Both ozone and particulate pollution are associated with increased rates of strokes, heart attacks, respiratory disease, cancer and premature death. Outdoor air particulates have been associated with low and very low birth weight, premature birth, congenital defects, and death. At the 2010 census, the city's population was 75.1% White, 2.7% African American, 1.2% American Indian and Alaska Native, 4.4% Asian, 2.0% Native Hawaiian and other Pacific Islander, 10.7% from other races and 3.7% of mixed descent. 22.3% of the total population were Hispanic or Latino of any race. 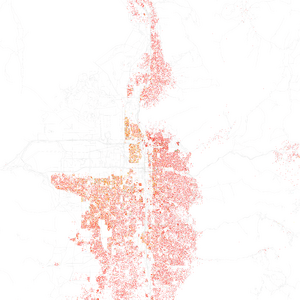 Salt Lake City's population has historically been predominantly white. 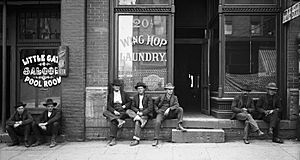 Between 1860 and 1950 whites represented about 99% of the city's population. 37.0% of the population had a bachelor's degree or higher. 18.5% of the population was foreign born and another 1.1% was born in Puerto Rico, U.S. insular territories, or born abroad to American parent(s). 27.0% spoke a language other than English at home. As of the census of 2010, there are 186,440 people (up from 181,743 in 2000), 75,177 households, and 57,543 families residing in the city. This amounts to 6.75% of Utah's population, 18.11% of Salt Lake County's population, and 16.58% of the new Salt Lake metropolitan population. The area within the city limits covers 14.2% of Salt Lake County. Salt Lake City is more densely populated than the surrounding metro area with a population density of 1,688.77/sq mi (1,049.36/km²). There are 80,724 housing units at an average density of 731.2 per square mile (454.35/km²). The Salt Lake City-Ogden metropolitan area, which included Salt Lake, Davis, and Weber counties, had a population of 1,333,914 in 2000, a 24.4% increase over the 1990 figure of 1,072,227. Since the 2000 Census, the Census Bureau has added Summit and Tooele counties to the Salt Lake City metropolitan area, but removed Davis and Weber counties and designated them as the separate Ogden-Clearfield metropolitan area. The Salt Lake City-Ogden-Clearfield combined statistical area, together with the Provo-Orem metropolitan area, which lies to the south, have a combined population of 2,094,035 as of 1 July 2008. The median age is 30 years. For every 100 females there are 102.6 males. For every 100 females age 18 and over, there are 101.2 males. The median income for a household in the city is $36,944, and the median income for a family is $45,140. Males have a median income of $31,511 versus $26,403 for females. The per capita income for the city is $20,752. 15.3% of the population and 10.4% of families are below the poverty line. Out of the total population, 18.7% of those under the age of 18 and 8.5% of those 65 and older are living below the poverty line. Fewer than 50% of Salt Lake City's residents are members of The Church of Jesus Christ of Latter-day Saints. This is a much lower proportion than in Utah's more rural municipalities; altogether, LDS members make up about 62% of Utah's population. The Rose Park and Glendale sections are predominantly Spanish-speaking with Hispanic and Latino Americans accounting for 60% of public school-children. 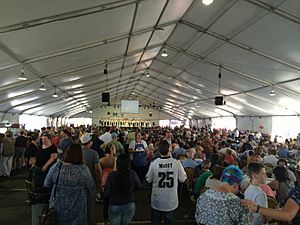 The Centro Civico Mexicano acts as a community gathering point for the Wasatch Front's estimated 300,000 Latinos, Mexican President Vicente Fox began his U.S. tour in the city in 2006. Salt Lake City is home to a sizeable Bosnian American community of more than 8,000 residents. Most of them came to Salt Lake City during the Bosnian War in the 1990s. The large Pacific Islander population, mainly Samoan and Tongan, is also centered in the Rose Park, Glendale, and Poplar Grove sectors. 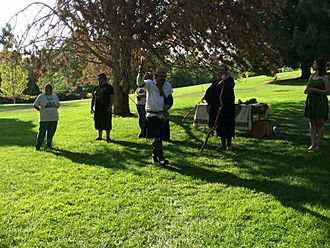 Most of Salt Lake City's ethnic Pacific Islanders are members of the LDS Church though various Samoan and Tongan-speaking congregations are situated throughout the Salt Lake area including Samoan Congregational, Tongan Wesleyan Methodist, and Roman Catholic. Just outside Salt Lake City limits, newer immigrant communities include Nepalis, and refugees of Karen origin from Myanmar (formerly Burma). Salt Lake City also has the third largest Sri Lankan community in the United States. Salt Lake City has been considered one of the top 51 "gay-friendly places to live" in the U.S. The city is home to a large, business savvy, organized, and politically supported gay community. Leaders of the Episcopal Church's Diocese of Utah, as well as leaders of Utah's largest Jewish congregation, the Salt Lake Kol Ami, along with three elected representatives of the city identify themselves as gay. These developments have attracted controversy from socially conservative officials representing other regions of the state. A 2006 study by UCLA estimates approximately 7.6% of the city's population, or almost 14,000 people, are openly gay or bisexual, compared to just 3.7%, or just over 60,000 people, for the metropolitan area as a whole. In 2007 Salt Lake City was ranked by Forbes as the most vain city in America, based on the number of plastic surgeons per 100,000 and their spending habits on cosmetics, which exceed cities of similar size. However, this likely reflects a concentration of plastic surgeons within the city limits but whose client base includes the entire metropolitan area. Forbes also found the city to be the 8th most stressful. In contrast to the 2007 ranking by Forbes, a 2010 study conducted by Portfolio.com and bizjournals concluded Salt Lake City was the least stressful city in the United States. In 2014, CNN deemed Salt Lake City to be the least stressed-out city in the United States, citing the low cost of living and abundance of jobs. Salt Lake City is home to several museums. Near Temple Square is the Church History Museum; operated by The Church of Jesus Christ of Latter-day Saints, the museum contains collections of artifacts, documents, art, photographs, tools, clothing and furniture from the history of the LDS Church, which spans nearly two centuries. West of Temple Square, at The Gateway, is the Clark Planetarium, which houses an IMAX theater, and Discovery Gateway, a children's museum. The University of Utah campus is home to the Utah Museum of Fine Arts as well as the Natural History Museum of Utah. Other museums in the area include the Utah State Historical Society, Daughters of Utah Pioneers Memorial Museum, Fort Douglas Military Museum, the Social Hall Heritage Museum, and The Leonardo, a new art, science and technology museum. Salt Lake City provides many venues for both professional and amateur theatre. The city attracts many traveling Broadway and Off-Broadway performances which perform in the historic Capitol Theatre. Local professional acting companies include the Pioneer Theatre Company, Salt Lake Acting Company and Plan-B Theatre Company, which is the only theatre company in Utah fully devoted to developing new plays by Utah playwrights. The Off-Broadway Theatre, located in Salt Lake's historic Clift Building, features comedy plays and Utah's longest-running improv comedy troupe, Laughing Stock. Salt Lake City is the home of the Mormon Tabernacle Choir, founded in 1847. The choir's weekly program, called Music and the Spoken Word, is the longest-running continuous network broadcast in the world. Salt Lake City is also the home to the Utah Symphony Orchestra, which was founded in 1940 by Maurice Abravanel and has become widely renowned. Its current music director is Thierry Fischer. The orchestra's original home was the Salt Lake Tabernacle, but since 1979 has performed at Abravanel Hall in the western downtown area. In 2002, Utah Symphony merged with Utah Opera, which was founded in 1978 by Glade Peterson and under current Artistic Director Christopher McBeth presents four opera productions at Capitol Theatre in downtown Salt Lake City. Salt Lake City area is also home to the internationally renowned children's choir from The Madeleine Choir School and the Salt Lake Children's Choir (established in 1979). The University of Utah is home to two highly ranked dance departments, the Ballet Department and the Department of Modern Dance. 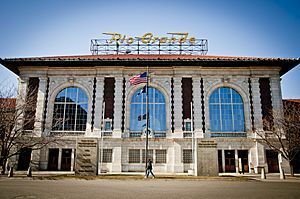 Professional dance companies in Salt Lake City include Ballet West, Ririe-Woodbury Dance Company (which celebrated its 45th anniversary season in 2008/2009) and Repertory Dance Theatre. RWDC and RDT both call the Rose Wagner Performing Arts Center home. The city has a local music scene dominated by hip hop, blues, rock and roll, punk, Deathcore, horrorcore and indie groups. There are also many clubs which offer musical venues. Popular groups or persons who started in the Wasatch Front area or were raised and influenced by it, including Iceburn, Eagle Twin, The Almost, The Brobecks, Meg and Dia, Royal Bliss, The Artificial Flower Company, Shedaisy, The Summer Obsession, The Used and Chelsea Grin. Salt Lake also has an underground metal scene, which includes bands such as Gaza and Bird Eater. In 2004 over 200 bands submitted tracks for a compilation by a local music zine, SLUG Magazine. The zine trimmed the submissions to 59 selections featuring diverse music types such as hip-hop, jazz, jazz-rock, punk and a variety of rock and roll. In the summer, Salt Lake City also hosts the Twilight Concert series which is a free summer concert series for all the residents in the city. 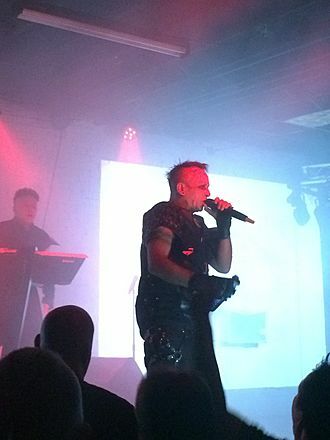 The series has been a part of the Salt Lake City music scene for 23 years. In year 2010, crowds peaked at 40,000 attendees in downtown's Pioneer Park. The Great Salt Lake City Yoga Festival is in its fifth year as of 2015[update]. 2015 saw the first Downtown Yoga festival in Salt Lake City. Both festivals are intended to inspire yogis in the community by teaching about yoga, healthy living, raw food, and traditional yoga music. Salt Lake City is host to a number of conventions that come to the Crossroads of the West. 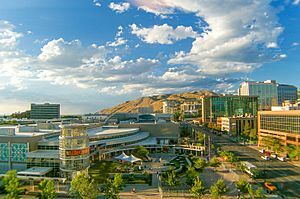 With several large venues, including the Salt Palace and Vivint Smart Home Arena in downtown, Salt Lake is capable of accommodating conventions upwards of 100,000 or more people. Salt Lake Comic Con, which started in 2013, has grown to over 100,000 people in just over two years. Because of this, Salt Lake Comic Con started having a second event, FanX (Fan Experience) to give those who were not able to come to the fall Comic Con an opportunity in the spring. The convention broke inaugural records in 2013, hosting the largest crowd of any inaugural comic convention. The second event, FanX of 2014, and the fall event of 2014 both broke attendance records for the event, surpassing 120,000 people. The convention was sued by San Diego Comic Con, but won the right to use the trademark of comic con in its name. In 2014, Stan Lee called the Salt Lake Comic Con "the greatest comic con in the world". On 25 September 2015 at 6 pm, the Con broke the world record for the most costumed comic book cosplay characters in one location. At 1784 people, this beat the previous record by about 250, surpassing the International Animation CCJOY LAND in Changzhou City, China, which had gathered 1530 people on 29 April 2011. A My Little Pony convention called Crystal Mountain Pony Con takes place annually downtown, with many cosplayers, vendors, and panels. 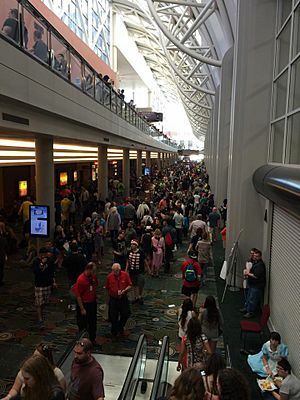 2015 saw more than 800 bronies in attendance. Salt Lake hosts its own International Tattoo Convention in the spring. The Salt Lake City International Tattoo Convention brings in various artists from around the United States and world. A select few local shops are allowed to attend, but the highlights of the convention are well-known artists who are booked for the convention. 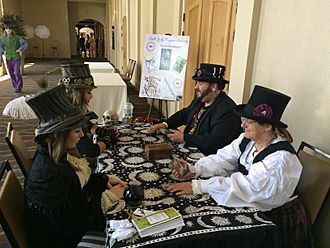 Fantasy Con hosted its first convention, the first of its kind, in Salt Lake City in 2014. After a successful run, the convention reorganized to better serve the needs of the fantasy community. Intended to be annual, it did not host one for 2015 but will have another convention in 2016. 2014 saw over 30,000 attend. 2015 saw the first Gaming Convention come to Salt Lake City. The convention included contests, cosplay, panels, and was centered around console, computer, card, and tabletop gaming. Although the LDS church holds a large influence, the city is still very culturally and religiously diverse. The city is the location of many cultural activities. A major state holiday is Pioneer Day, 24 July, the anniversary of the Mormon pioneers' entry into the Salt Lake Valley. It is celebrated each year with a week's worth of activities, including a children parade, a horse parade, the featured Days of '47 Parade (one of the largest parades in the United States), a rodeo, and a large fireworks show at Liberty Park. Fireworks can be legally sold and set off around 24 July. 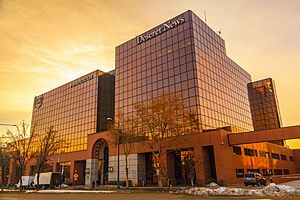 Print media include two major daily newspapers, The Salt Lake Tribune and the Deseret News (previously the Deseret Morning News). Other more specialized publications include Now Salt Lake, Salt Lake City Weekly, Nuestro Mundo of the Spanish-speaking community, QSaltLake and The Pillar for the LBGT community. Other Spanish-language newspapers include El Estandar, Amigo Hispano (online only), and El Observador de Utah, which offers free residential delivery. There are a number of local magazines, such as Wasatch Journal (a quarterly magazine covering Utah's arts, culture, and outdoors), Utah Homes & Garden, Salt Lake Magazine (a bimonthly lifestyle magazine), CATALYST Magazine (a monthly environmental, health, arts and politics magazine), SLUG Magazine, an alternative underground music magazine. Utah Stories is a magazine that covers local issues, primarily focused on the Salt Lake Valley. KTVX signed on the air as Utah's first television station in 1947 under the experimental callsign W6SIX. KTVX is the oldest TV station in the Mountain Time Zone and the third oldest west of the Mississippi. It is Salt Lake City's current ABC affiliate. KSL-TV, the local NBC affiliate, has downtown studios at "Broadcast House" in the Triad Center office complex. KSL is operated by Deseret Media Companies, a company owned by the LDS Church. 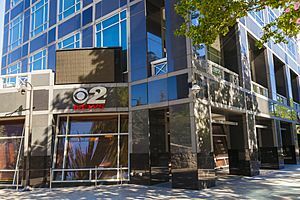 KUTV is Salt Lake City's CBS affiliate. KSTU is the area's Fox affiliate. KUCW is the CW affiliate and part of a duopoly with KTVX. KJZZ-TV is an independent station owned by the family of late Utah Jazz owner Larry H. Miller. Salt Lake City has become a case of market saturation on the FM dial; one cannot go through more than about two frequencies on an FM radio tuner before encountering another broadcasting station. A variety of companies, most notably Millcreek Broadcasting and Simmons Media, have constructed broadcast towers on Humpy Peak in the Uinta Mountains to the east. These towers allow frequencies allocated to nearby mountain communities to be boosted by smaller, low-powered FM transmitters along the Wasatch Front. Salt Lake City is the headquarters for The Church of Jesus Christ of Latter-day Saints (LDS Church) and has many LDS-related sites open to visitors. The most popular is Temple Square, which includes the Salt Lake Temple (not open to the general public) and visitors' centers open to the public, free of charge. Temple Square also includes the historic Tabernacle, home of the world-famous Mormon Tabernacle Choir. The modern LDS Conference Center is across the street to the north. The Family History Library, the largest genealogical library in the world, is just west of Temple Square. 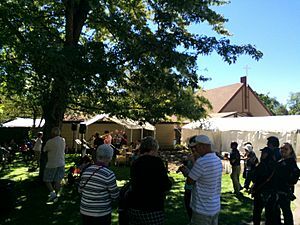 It is run by the LDS Church and is open to the public and free of charge. Adjacent to Temple Square is also the Eagle Gate Monument. 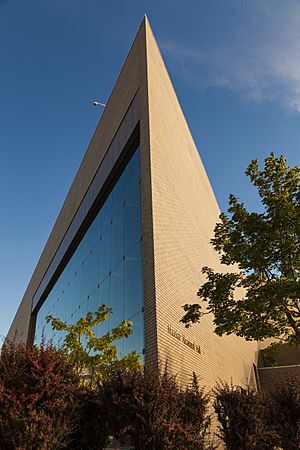 In 2004, the Salt Lake City main library received an Institute Honor Award for Architecture by the American Institute of Architects and features a distinctive architectural style. The roof of the building serves as a viewpoint for the Salt Lake Valley. The Utah State Capitol Building offers marble floors and a dome similar to the building that houses the U.S. Congress. Other notable historical buildings include the Thomas Kearns Mansion (now the Governor's Mansion), City and County Building, built in 1894, the Kearns Building on Main Street, St. Mark's Episcopal Cathedral, built in 1874, and the Roman Catholic Cathedral of the Madeleine, built in 1909. Near the mouth of Emigration Canyon lies This Is The Place Heritage Park, which re-creates typical 19th century LDS pioneer life. Hogle Zoo is located across the street from the park. The city's largest public park, at over 100 acres (0.40 km2), Liberty Park features a lake with two islands in the middle and the Tracy Aviary. The park is home to a large number of birds, both wild and in the aviary. Red Butte Garden and Arboretum, located in the foothills of Salt Lake City, features many different exhibits and also hosts many musical concerts. Jordan Park is home to the International Peace Gardens. The Bonneville Shoreline Trail is a popular hiking and biking nature trail which spans ninety mi through the foothills of the Wasatch Front. 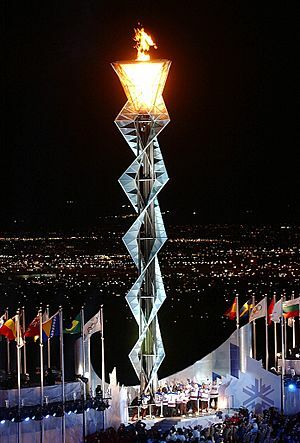 The Olympic Cauldron Park at Rice-Eccles Stadium, features the Olympic Cauldron from the games, a visitor's center, and the Hoberman Arch. The Olympic Legacy Plaza, located at The Gateway, features a dancing fountain set to music and the names of 30,000 Olympic volunteers carved in stone. The Utah Olympic Park, located near Park City, features the Olympic ski jumps, as well as bobsleigh, luge, and skeleton runs. Today, the Olympic Park is used for year-round training and competitions. Visitors to the park can watch the various events and even ride a bobsled. The Utah Olympic Oval, located in nearby Kearns, was home to the speed skating events and is now open to the public. Other popular Olympic venues include Soldier Hollow, the site of cross-country skiing events, located southeast of Salt Lake near Heber City. Salt Lake City is close to several world-class ski and summer resorts, including Snowbird, Alta, Brighton, Solitude, Park City Mountain Resort, and Deer Valley. The resorts cater to millions of visitors each year and offer year-round activities. Salt Lake City is also home to a few major shopping centers. Trolley Square is an indoor and outdoor mall with many independent art boutiques, restaurants, and national retailers. The buildings housing the shops are renovated trolley barns with cobblestone streets. 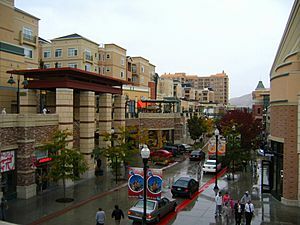 The Gateway, an outdoor shopping mall, has many national restaurants, clothing retailers, a movie theater, the Clark Planetarium, the Discovery Gateway (formerly The Children's Museum of Utah), a music venue called The Depot, and the Olympic Legacy Plaza. City Creek Center is the city's newest major shopping center and features many high-end retailers not found anywhere else in Utah. On 3 October 2006, the LDS Church, who owned the ZCMI Center Mall and Crossroads Mall, both on Main Street, announced plans to demolish the malls, a skyscraper, and several other buildings to make way for the $1.5 billion City Creek Center redevelopment. It combined several new office and residential buildings (one of which is the third-tallest building in the city) around an outdoor shopping center featuring a stream, fountain, and other outdoor amenities; it opened on 22 March 2012. Sugar House is a neighborhood with a small town main street shopping area and numerous old parks, which will soon be served by the S Line (formerly known as Sugar House Streetcar). Sugar House Park is the second largest park in the city, and is host to frequent outdoor events and the primary Fourth of July fireworks in the city. Other attractions in or within close proximity to Salt Lake City include Timpanogos Cave National Monument, the Golden Spike National Historic Site (where the world's first transcontinental railroad was joined), the Lagoon (amusement park), the Great Salt Lake, the Bonneville Salt Flats, Gardner Historic Village, one of the largest dinosaur museums in the U.S. at Thanksgiving Point in Lehi, and the world's largest man-made excavation at Bingham Canyon Mine. Winter sports, such as skiing and snowboarding, are popular activities in the Wasatch Mountains east of Salt Lake City. Eight ski resorts lie within 50 miles (80 km) of the city. Alta, Brighton, Solitude, and Snowbird all lie directly to the southeast in the Wasatch Mountains, while nearby Park City contains three more resorts. The popularity of the ski resorts has increased nearly 29 percent since the 2002 Winter Olympics. Summer activities such as hiking, camping, rock climbing, mountain biking, and other related outdoor activities are popular in the mountains, as well. The many small reservoirs and rivers in the Wasatch Mountains are popular for boating, fishing, and other water-related activities. 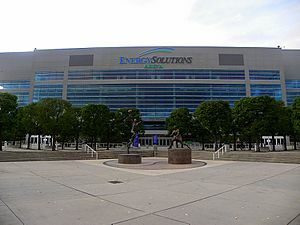 Salt Lake City is home to the Utah Jazz of the National Basketball Association (NBA), who moved from New Orleans in 1979 and play their home games in Vivint Smart Home Arena (formerly known as the Delta Center and later known as EnergySolutions Arena). They are the only team from one of the four top-level professional sports leagues in the state. They have been to the playoffs in 22 of the last 25 seasons, making them among the most successful in the NBA in that time span, but have yet to win a championship. Salt Lake City was previously home to a professional basketball team, the Utah Stars of the American Basketball Association (ABA), between 1970–75. They won one championship in the city (in 1971) and enjoyed some of the strongest support of any ABA team, but they folded just months before the ABA–NBA merger, thus preventing them from being absorbed by the NBA. The success of the Stars may have had a hand in the decision by the struggling Jazz to relocate to Salt Lake City in 1979. Arena football expanded into the city in 2006 with the Utah Blaze of the Arena Football League. They recorded the highest average attendance in the league in their first season. After the original AFL folded in 2009, the future of the Blaze was unclear. However, a new league branded as the Arena Football League began play in 2010. The Blaze franchise was restored and is playing in the new league. There are also two minor league teams located in the city. 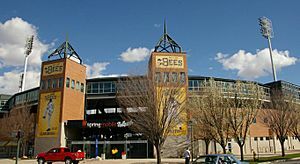 The Salt Lake Bees, a Pacific Coast League Triple A affiliate of the Los Angeles Angels of Anaheim, play at Smith's Ballpark and were established in 1994 as the Buzz. Their name was changed to the Stingers in 2002 and to the Bees, a historical Salt Lake City baseball team name, in 2006. The Utah Grizzlies hockey team of the ECHL were established in 2005, replacing the previous Grizzlies team that existed from when they relocated from Denver in 1995 to 2005 in the International Hockey League (IHL) and, later, the American Hockey League (AHL). They play at the Maverik Center in neighboring West Valley City. Utah lacks a professional football team of its own, and college football is very popular in the state. The University of Utah and Brigham Young University both maintain large followings in the city, and the rivalry between the two colleges has a long and storied history. Despite the fact Utah is a secular university, the rivalry is sometimes referred to as the Holy War because of BYU's status as an LDS university. Until the 2011–12 season, they both played in the Mountain West Conference of the NCAA's Division I and have played each other 90 times since 1896 (continuously since 1922). The University of Utah was the first school from a non-BCS conference to win two BCS bowl games (and was the first from outside the BCS affiliated conferences to be invited to one) since the system was introduced in 1998. The University of Utah was a part of the controversy surrounding the fairness of the Bowl Championship Series (BCS) of college football. Despite undefeated seasons in both 2004 and 2008, Utah was not invited to participate in the national championship in either season because it was a member of the Mountain West Conference, a non-BCS conference. The Utah Avalanche, formed in January 2011, were a development rugby league team for the now defunct American National Rugby League. The Utah Warriors were a rugby union team that competed in the Rugby Super League in 2011, playing their home games at Rio Tinto Stadium. In June 2012, Salt Lake City hosted the IRB Junior World Rugby Trophy, a major international rugby union tournament for under-20 national teams from "second-tier" nations. 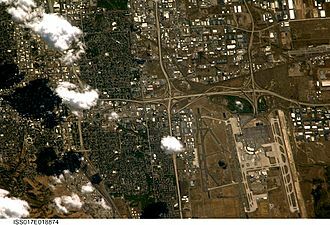 Salt Lake City lies at the convergence of two cross-country freeways; I-15, which runs north-to-south just west of downtown, and I-80, which connects downtown with Salt Lake City International Airport just to the west and exits to the east through Parley's Canyon. I-215 forms a 270-degree loop around the city. SR-201 extends to the western Salt Lake City suburbs. The Legacy Parkway (SR-67), a controversial and oft-delayed freeway, opened September 2008, heading north from I-215 into Davis County along the east shore of the Great Salt Lake. Travel to and from Davis County is complicated by geography as roads have to squeeze through the narrow opening between the Great Salt Lake to the west and the Wasatch Mountains to the east. Only four roads run between the two counties to carry the load of rush hour traffic from Davis County. Salt Lake City's surface street system is laid out on a simple grid pattern. Road names are numbered with a north, south, east, or west designation, with the grid originating at the southeast corner of Temple Square downtown. 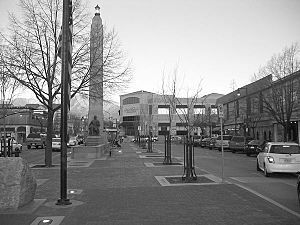 One of the visions of Brigham Young and the early settlers was to create wide, spacious streets, which characterizes downtown. The grid pattern remains fairly intact in the city, except on the East Bench, where geography makes it impossible. 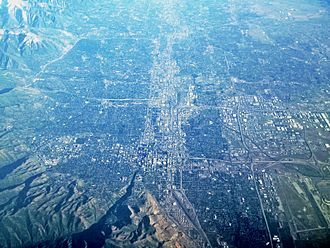 The entire Salt Lake Valley is laid out on the same numbered grid system, although it becomes increasingly irregular further into the suburbs. Many streets carry both a name and a grid coordinate. Usually both can be used as an address. 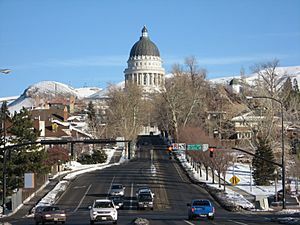 US-89 enters the city from the northwest and travels the length of the valley as State Street (with the exception of northern Salt Lake City). 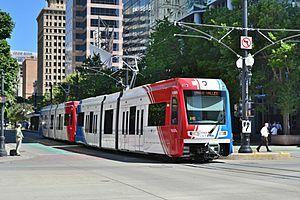 Salt Lake City's mass transit service is operated by the Utah Transit Authority (UTA) and includes a bus system, light rail, and a commuter rail line. Intercity services are provided by Amtrak and various intercity bus lines. These services are all interconnected at the Salt Lake City Intermodal Hub (Salt Lake Central Station) located a short distance west of the city center. 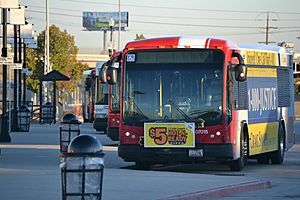 The Brookings Institution in 2011 rated Salt Lake City's mass transit system as the third-best in the nation at connecting people to jobs, providing access to 59% of the jobs in the valley. The 44.8-mile (72.1 km) light rail system, called TRAX, consists of three lines. The Blue Line, which opened in 1999 and was expanded in 2008, travels from the Salt Lake City Intermodal Hub (Salt Lake Central Station), south to the nearby city of Draper. The Red Line, which originally opened in 2001 and was expanded in 2011, runs from the University of Utah, south-west through Salt Lake to the community of Daybreak in South Jordan. A third line, known as the Green Line, opened in 2011 and runs from the Salt Lake City International Airport to West Valley City (via Downtown Salt Lake City), with the extension to the airport having opened in April 2013. The system has a total of 50 stations of which 23 are within the city limits. Daily ridership averaged 60,600 as of the fourth quarter of 2012, making TRAX the ninth most-ridden light rail system in the country. The commuter rail system, FrontRunner, opened on 26 April 2008 and extends from the Intermodal Hub north through Davis County to Pleasant View on the northern border of Weber County. Daily ridership on the line averages 7,800, as of the fourth quarter of 2012. An expansion called "FrontRunner South", which extended FrontRunner south to Provo in central Utah County, was completed in December 2012 as part of UTA's FrontLines 2015 project. These extensions were made possible by a sales tax hike for road improvements, light rail, and commuter rail approved by voters on 7 November 2006. 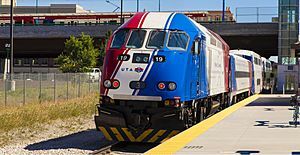 In addition, a $500 million letter of intent was signed by the Federal Transit Administration for all four of the planned TRAX extensions in addition to the FrontRunner extension to Provo. Amtrak, the national passenger rail system, provides service to Salt Lake City operating its California Zephyr daily in both directions between Chicago and Emeryville, California. Greyhound Lines serves Salt Lake City as well. Their nine daily buses provide service to Denver, Reno, Las Vegas, and Portland. Both of these stations are located at the Salt Lake City Intermodal Hub. 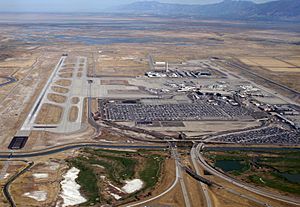 Salt Lake City International Airport is approximately 4 miles (6 km) west of downtown. Delta Air Lines operates a hub at the airport, serving over 100 non-stop destinations in the United States, Mexico, and Canada, as well as Paris and Amsterdam. SkyWest Airlines operates its largest hub at the airport as Delta Connection, and serves 243 cities as Delta Connection and United Express. The airport is served by 4 UTA bus routes, and a UTA operated light rail line (TRAX) opened services on 14 April 2013. A total of 22,029,488 passengers flew through Salt Lake City International Airport in 2007, representing a 2.19% increase over 2006. The airport ranks as the 21st busiest airport in the United States in total passengers, is consistently rated first in the country in on-time arrivals and departures, and has the second-lowest number of cancellations. There are two general aviation airports nearby; South Valley Regional Airport in West Jordan and Skypark Airport in Woods Cross. Salt Lake City is widely considered a bicycle-friendly city. In 2010, Salt Lake City was designated as a Silver-level Bicycle Friendly Community by the League of American Bicyclists, placing the city in the top 18 bicycling cities in the U.S. with a population of at least 100,000. Many streets in the city have bike lanes, and the city has published a bicycle map. However, off-road biking in the valley has suffered significantly as access to trails and paths has declined with the increase of housing developments and land privatization. In 2012, the Salt Lake Transportation Division launched BikeSLC.com, which consolidates the city's information about bicycle routes, safety, and promotions. The website includes a form for business owners to request bicycle racks to be installed on public property free of charge close to their businesses, a service that has a months-long waiting list. Salt Lake City was the first city in the United States to use the "Green Shared Lane", also known as a "super sharrow", a 4-foot (1.2 m) wide green band down the middle of a travel lane where adding a dedicated bike lane is unfeasible. Other cities such as Long Beach, California, Oakland, California, and Edina, Minnesota, have since introduced similar designs. These four cities are currently participating in a study by the Federal Highway Administration to measure the effect of the design on automobile speed and passing distance when overtaking bicycles, crashes between automobiles and bicycles, and whether it encourages more bicycle ridership, along with other metrics. On 25 September 2010, UTA in partnership with Salt Lake City, the Utah Department of Transportation, the Wasatch Front Regional Council, and the Mayor's Bicycle Advisory Committee, opened a Bicycle Transit Center (BTC) at the Intermodal Hub. The BTC is anticipated to serve multi-modal commuters from TRAX and FrontRunner, as well as providing a secure bicycle parking space for bicycle tourists who want to tour the city on foot or transit. In April 2013, Salt Lake City launched a bike share program known as GREENbike. The program allows users to pay $5 per day to access bicycles, with the option of purchasing a weekly or annual pass. As of the launch of the program, there were 10 stations located in the downtown core. By October 2014, the number of stations had expanded to 20. In addition to the bike sharing program, eighty businesses in the city participate in the Bicycle Benefits program, which provides discounts to customers who arrive by bicycle. The city is also home to the Salt Lake City Bicycle Collective. As a result of this increasing support, Salt Lake City's on-road bikeway network has grown to encompass 200 lane miles. In July 2014, the city began construction of a protected bicycle lane on a 1.35 miles (2.17 km) segment of 300 South between 300 West and 600 East. The project received significant opposition from business owners and residents along the route because of concerns about the 30% reduction in car parking spaces and disruptions resulting from construction. The construction preceded in stages, with the last stage completed in late October 2014. The performance of the protected bicycle lane (specifically, its role in encouraging more bicycle ridership) will influence future plans for making the city more bicycle-friendly. One popular example of the city's cycling and walking routes is the loop around City Creek Canyon on Bonneville Boulevard. The city has designated the road as one lane only (one-way) for motor vehicles, turning the other lane over to two-way cyclists and pedestrians. From the last Monday in May to the last weekend in September, City Creek Canyon Road itself is closed to motor vehicles on odd-numbered days, while bicycles are prohibited on even-numbered days and holidays. Bicycles are allowed every day for the rest of the year. Salt Lake City Public Library. The American Library Association called it the best in the U.S. in 2006. Salt Lake City Facts for Kids. Kiddle Encyclopedia.